Sinomach loaders ... easy operation. KiCE Construction Equipment, a leading manufacturer of batching plant and components, has become the exclusive distributor in Saudi Arabia for the China-based Sinomach Heavy Industry Corporation following the signing of a licensing agreement. A top manufacturer of engineering vehicles and heavy equipment, Sinomach is a wholly owned subsidiary of China National Machinery Industry Corporation based in China. Under the new agreement, KiCE will sell Sinomach products including its mobile cranes and wheel loaders across the kingdom. 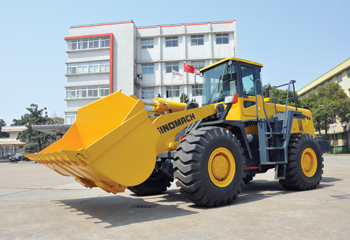 Sinomach’s wheel loader model 9126 is claimed to be the biggest wheel loader in China. Its loader factory, which has advanced mechanical production technology, supplies boom and axles for Komatsu and Hyundai. The Chinese firm’s 967 model loader weighs six tonnes and has a capacity of 3.5 cu m. It features the KD switch, which ensures higher efficiency and easy operation; in addition to the Meritor dry type axle, ZF transmission case and torque converter; automatic bucket levelling ability and boom position limitation; and a combined seal cylinder. The mobile cranes have been co-designed with Terex and have the same parameters and settings as the Terex toplift series. They come in two series – TTCO55G and TTCO70G, said the company. The TTCO55G mobile crane weighs 41,880 kg and has a 55-tonne main boom lifting capacity. Weighing 46,000 kg, the TTCO70G mobile crane has a maximum lifting moment of 2,354.4 KN, which is claimed to be an industry leading level. A 7.8-m horizontal span of outriggers provides the machine a secure and high lifting reliability. The agreement also enables KiCE to provide customers a one-stop shop for all kinds of premium quality construction equipment, he added.